It’s Monday! Here’s What I’m Reading: Beyond the Bright Sea & Orphan Island. The lobster cakes were hot and buttery, brown and crunchy on the outside, sweet and white on the inside. She’s baked cheese into the biscuits and topped each one with a dab of pepper relish. For dessert she’d brought out a dish of strawberries dusted with a little cane sugar. The breeze curtsied as it passed by. A chimney swift sketched a curlicue overhead. If there had been music, it might have been too much to bear. This will be our first read aloud of the year;Beyond The Bright Sea is the perfect book with which to launch a year of joyous reading. 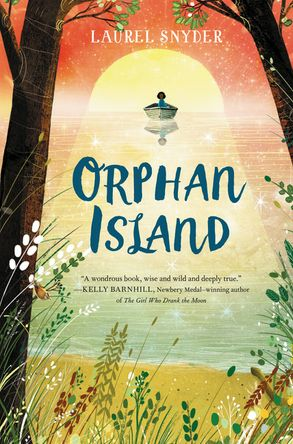 Every aspect of the actual island in Orphan Island is beautifully imagined and vividly described – it becomes another character in the story, to be deciphered, empathized with, and understood. As Jinny enters her Elder-hood, she cannot imagine ever leaving this magical place of serene predictability, even though the rules say that leave she must. The closer she gets to Changing Day, the more she wants things to stay the way they are, even it it means breaking the rules and opening the island and its nine inhabitants to all sorts of dangers she can barely even imagine. But, Jinny wants what Jinny wants, it’s a character trait everyone else on the island has come to know well. The question is, will Jinny be able to take that step into maturity that all children must learn to do: putting aside what she wants so that the island she so loves can continue to exist as it does for benefit of other children. The writer Anne Ursu described Orphan Island as a “lovely fable of childhood and change” – and that is exactly right. I can’t wait to share it with my sixth graders in the Fall. So glad you liked Beyond the Bright Sea! I fell in love with it too. I have an ARC from our book club of Orphan Island, so I’ll tuck it in my bag for an upcoming trip. Just finished Beyond the Bright Sea five and was searching for conversations about it. The power of family as defined by Wolk is a breath of fresh air. I loved how Osh allowed Crow to search for what she needed to find. I know that there’s a long history of removing adult characters in MG books so that the child characters can have more autonomy, allowing readers to live out their adventures vicariously, but I definitely agree that there can often be a real need for reassuring adult characters. Osh and Miss Maggie kind of remind me of Marilla and Matthew in Anne of Green Gables, adult characters who never thought they’d be parents, and just try and do the best they can! Both wonderful books! Both authors are very talented! I loved Beyond the Bright Sea. I think your students would enjoy it as a read aloud. Beyond the Bright Sea will make for a fabulous read aloud with lots of discussions. If Orphan Islam wasn’t already on my list, it sure would be now! Both of these books are on my To Read list! Hopefully I can find them at the library one of these days! Have a great week! Both of these books are high on my TBR list. Thanks for sharing your review. Happy Reading! These are both books I want to read. Now, it’s only a matter of finding time! I have both of these books on hold at the library so hope to be reading them soon! Thanks for all of your thoughts. Beautifully reviewed and on my book stack. It’s comforting to know there are wonderful books waiting in the wings!